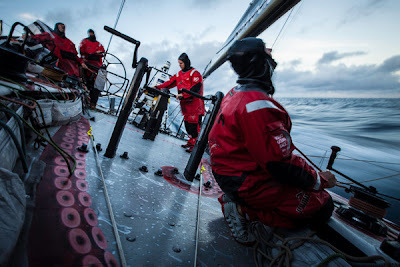 In complete contrast to the atrocities of the Southern Ocean, Leg 6 of the Volvo Ocean Race from Itajaí to Miami is a breeze, particularly for PUMA Ocean Racing powered by BERG (Ken Read/USA). Overnight PUMA steadily extended their lead over CAMPER with Emirates Team New Zealand (Chris Nicholson/AUS, by averaging a steady 15 knots on a broad reach towards the turning point at Recife some 235 nautical miles ahead on the north east coast of Brazil. 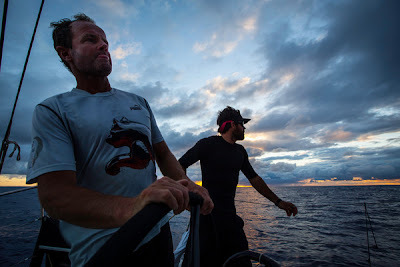 At 0700 GMT this morning, CAMPER had improved their boat speed to 15.2 knots to reduce PUMA’s lead by a mile to 19.20 nm and the rocket ship that is Telefónica (Iker Martínez/ESP), in third place to leeward of the pack, gained four miles on PUMA, averaging 16 knots. Meanwhile, Abu Dhabi Ocean Racing (Ian Walker/GBR) and Groupama (Franck Cammas/FRA) had all made losses, Groupama slipping back a further 12 nm to languish 94 nm behind the leader and only making a worrying 10.5 knots. As PUMA continues to set the pace, the crews are making the most of the near-perfect conditions. The sea is flat, it’s warm and dry on deck and, as sleep is easy and plentiful, it’s no hardship to wake up for a watch or sail change. What could almost have been considered a boring leg has been made fun for the crew by on-the-rail chitchat and planning for the future. 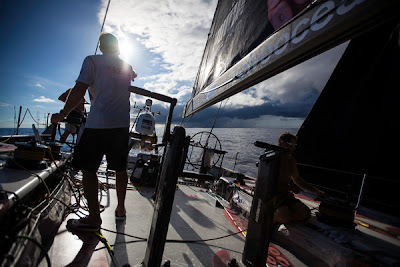 It will, however be short lived as according to PUMA navigator Tom Addis the fleet are approaching an area of the racetrack that will be largely dominated by clouds. “We’ll be active at all hours of the day and night from here on in,” he said. Once round the north east corner of Brazil, the wind should become more favourable, allowing the fleet a choice of where to cross the equator and then pass through the Doldrums for the final time. The Doldrums are usually fairly narrow in the west Atlantic, so the passage through should be without too much difficulty, just a narrow band of squalls and calms for the crews to negotiate before finding the trade winds on the other side. The equatorial current will also give them a helping hand as they head towards the Caribbean next week.